Last week I witnessed a food fight. It was messy, nasty and sticky. In the aftermath, red jelly and pieces of cake stuck to the floor in a sad, splattered mess. But this wasn’t some toddler party or some misdemeanor caused by Katy Perry – it was theatre. 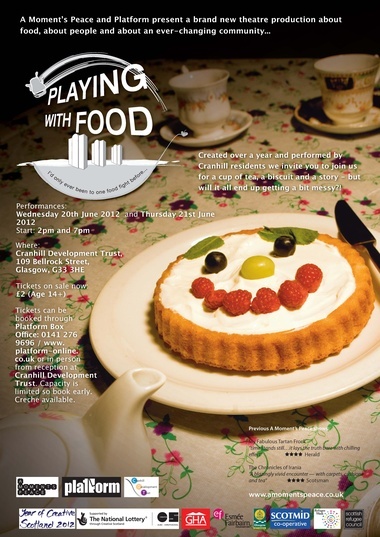 Playing With Food: Meals And Memories was the result of a year-long collaborative project formed by Glasgow’s Cranhill residents and A Moment’s Peace Theatre Company in partnership with Platform Theatre, and also part of Refugee Week Scotland 2012. The show was held in Cranhill Parish church, and I didn’t know what to expect. We were ushered in by the cast to a cozy hall. No standard seating here – there were comfy sofas, armchairs, big cushions, throws, tables and dimmed lights from standard lamps, all reminiscent of a large living room. Once seated, the residents served tea in proper china cups and saucers. This was welcoming and homely. Ok – where’s the cake and biscuits? And that was the problem – empty tins – Annie had eaten them all. And so the play started – they were going to bake us a cake. Food and the rituals around eating is a simple, effective and clever way to tell a story. 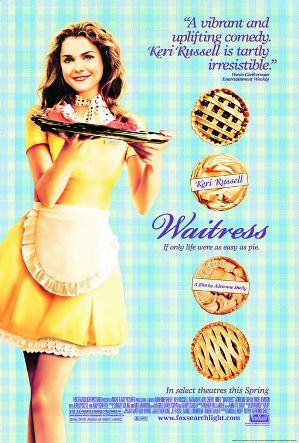 From films like Chocolat to The Waitress and Fried Green Tomatoes At The Whistlestop Cafe, food can be a focus. It can be used to console and celebrate … as well as a basic means of survival. 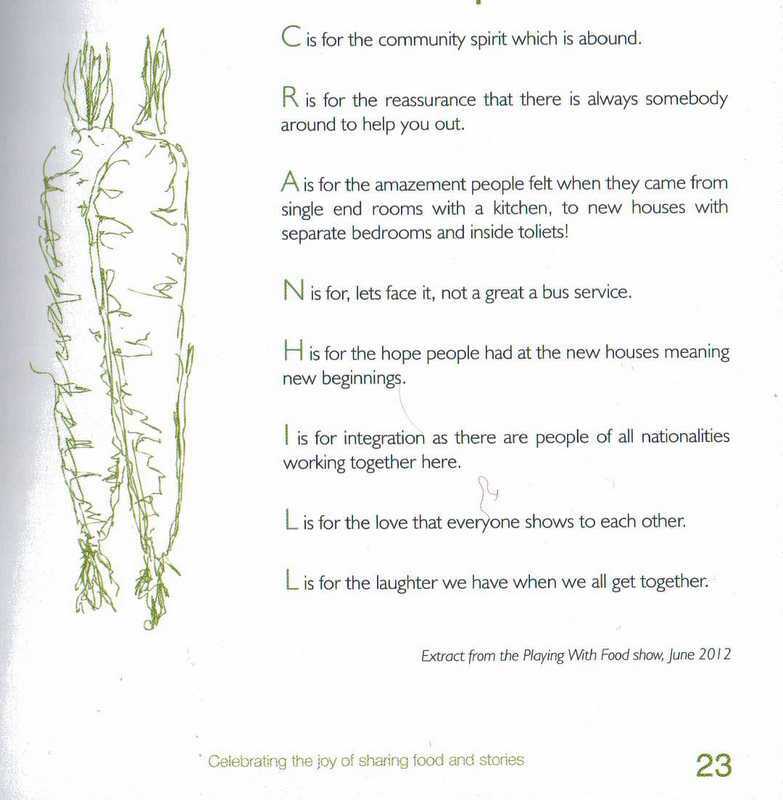 It has the power to create divisions between the wealthiest and poorest but it can also bring communities together – and this is what Cranhill shared with us – their community spirit. And so the eight strong cast, residents in the area, with no previous acting experience, donned aprons and one by one sat on a stool in front of us and told their own story of Cranhill. We drank tea and listened to a series of funny, heartwarming and touching tales. Tales of hope, love, inspiration and things held dear – like a first experience of having a proper inside toilet, with a light. No more fumbling outside in the cold and dark and trying to keep the door shut with one hand. There were stories about food and cooking, from those who learned to cook watching their mothers and those whose mothers wouldn’t let the kids near the kitchen, to tales of trying to cook onion soup to impress a girlfriend. The residents wrote their own material. 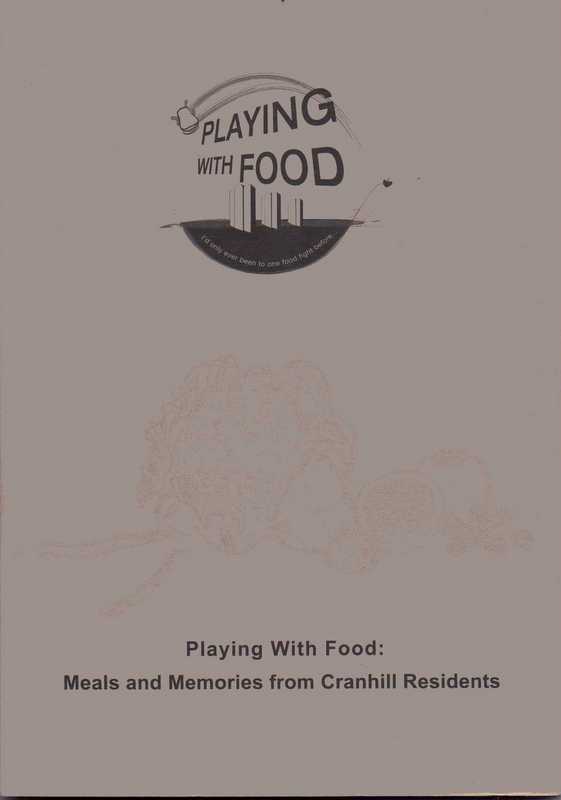 Angie Cunningham wrote a poem and Maureen Hamilton’s recipe for the area was a play on the word Cranhill. A cleverly choreographed scene where everyone worked in unison putting imaginary ingredients in a bowl and mixing was very effective. It was all very harmonious – so why the food fight? This part of the story was told from the perspective of a mother sitting between her “sons” played by Brian Greer and Denis Clark. It was meal time and the story started with “I’d only ever been to one food fight before …” and every course finished with “the food fight didn’t start here …”. The “boys” played up behind the mother’s back. Denis picked on Brian and made sure he got the blame for everything. Eventually we got to the dessert and the food fight began – all the cast came out wearing waterproof ponchos – jelly and cake was thrown around everywhere. This was an entertaining and well thought out play and there is a book to accompany it, which I would recommend. It’s only £4 and inside there’s lots of photos of Cranhill residents in their kitchens, people involved in Cranhill Development Trust and artistic staff from A Moment’s Peace Theatre Company. The little stories and comments bring the book to life and there’s lots of recipes, like Annie’s – who can make everything in a mug – even an afternoon teacake. 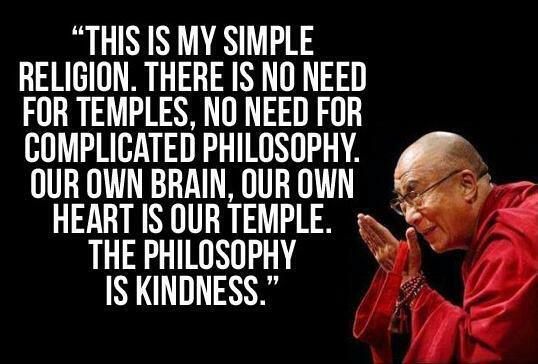 The 14th Dalai Lama is in Scotland today (June 22, 2012) and I’ve been thinking about him this week. A few weeks ago I watched a film at the Glasgow Film Theatre (GFT) called the Dalai Lama Renaissance. The film was not so much about the man himself as about the effect he has on others. In 1999, 40 of the West’s leading and most creative thinkers visited the Dalai Lama’s residence in Dharamsala, in the Himalayan Mountains of Northern India. The purpose of their meetings was to discuss the problems of the world and what changes could be made. However, things didn’t quite go to plan. 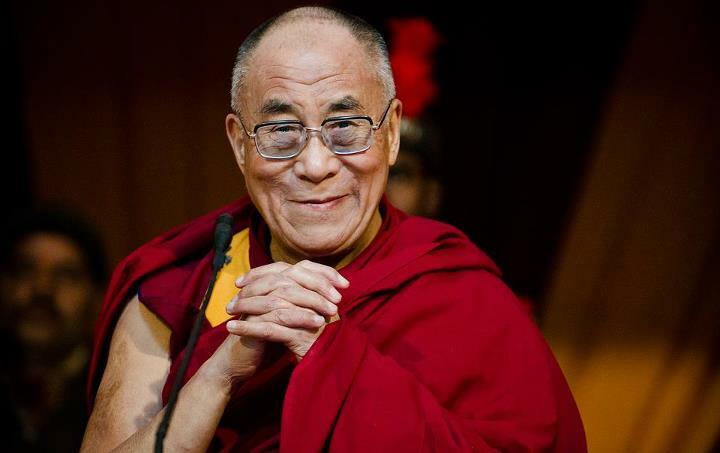 The group held meetings to discuss how they were going to approach the Dalai Lama. These meetings were often tense affairs. There were a lot of strong characters, with strong viewpoints and a quite a few egos. Discussions were heated and tempers were frayed. The film was funny at times, without perhaps meaning to be. It was entertaining to watch the dynamics and dramas unfolding. This fracas behind the scenes emphasized even more the disparity from the group to the serenity of the Dalai Lama. When he received them he was gracious; he listened intently, emanating calmness and reason among the group. He often broke into his trademark childish giggle and sometimes hearty chuckle. His replies were simple but effective. Often he would say “I’m just a simple monk”, as if amused by his power when he was asked to help them tackle the problems of the world head on. He reminded everyone “we are all equal here”. And the group could be impatient, keen to effect change immediately. After the film was screened at the GFT, film-maker Khashyar Darvich gave a Q&A session. A softly spoken, thoughtful man – you almost felt like he was one of the Dalai Lama’s monks. It transpired that as the film-maker, he was at one point thinking “what is the story here?” in among all his hours and hours of footage. But what became apparent to him, and then portrayed during the film were the lessons each person learned and the personal journeys they went on. Rather than fix the world – they had to fix themselves first. What comes from within emanates without. Be at peace to effect peace. More than a decade has passed since filming began and some of the people involved in this project have risen in profile and used their knowledge wisely. Quantum physicists Fred Alan Wolf and Amit Goswami went on to film What The Bleep Do We Know and Dr Michael Beckwith, a leader in the New Thought Movement has also appeared as a spiritual teacher in the movie The Secret. Brother Wayne Teasdale, monk, author and campaigner on social issues, featured heavily throughout the film, which is dedicated to him. He passed away in 2004. The film was narrated by Harrison Ford and the sentiments of the film were summed up in a quote read by Ford from Leo Tolstoy “Everybody thinks of changing humanity, and nobody thinks of changing himself”. 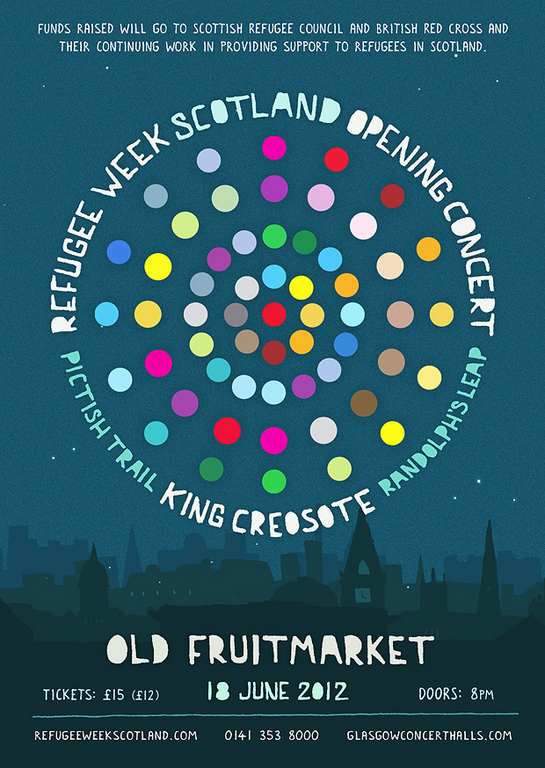 Not many of us realise what it’s like to be a refugee, myself included, and this gig which opened Refugee Week Scotland, gave us a little insight, as well as providing a fun night with quality music. All the boxes were successfully ticked. Some of Fence’s finest were out in force and this Fife Collective of merry men and women proved a perfect match for this event – because the Fence ethos is all about community and inclusiveness. You’re likely to get a piece at any Fence door, even if you have to sing or play for your supper. The night kicked off with Glasgow-based Randolph’s Leap, fronted by singer-songwriter Adam Ross, who sounds a perfect addition to the Fence roster with their folk-tinged pop. They ended their set with a cute little song called Crisps and proved they’re well worth checking out. The Pictish Trail followed with the always affable Johnny Lynch, also Fence co-founder, who was going to “let his hair down” and his set surprised as this often gentle balladeer showed some muscle with a more rock-infused set, showcasing songs from forthcoming album Secret Soundz Vol.2, including standout Of Course You Exist. At one point he went all sort of “Hot Chip” and stood at a keyboard tinkering away with lots of electronic sounds which sounded like a throwback to an 1980s disco. To remind us of the purpose of the night, a touching film was aired. The vastness of the Old Fruitmarket silently listened and watched as the refugees’ stories provoked a few moments of thoughtfulness and quiet introspection. Then it was all hail to the King of Fife, King Creosote (aka Kenny Anderson). Sometimes King Creosote gigs evoke nights of lovely gentle sea shanties along with a few raucous tunes but tonight it was more a full scale shindig. The dancing started at the back of the upstairs balcony and then the party moved downstairs to the front of the stage. It seemed to fire up the King who was in fine voice. He responded with a storming fast-paced set list which included old favourites You’ve No Clue and Nooks, as well as songs from current EP I Learned From The Gaels. The rousing closer Little Man featured the vocals of Gummi Bako. And even when the pace slowed down on the gorgeous lilt of John Taylor’s Month Away from Diamond Mine, KC’s Mercury nominated collaboration with Jon Hopkins, Kenny saying “It gets a bit faster, bear with me”, the crowd somehow managed to keep on dancing, swaying around with arms in the air. Refugee Week Scotland Video – Courage 60 Years of the UN Refugee Convention. For some recent information on King Creosote and The Pictish Trail check the links below. One of the things I love about my job is meeting people. People are interesting, everyone has a story. I have studied psychology, so I’m fascinated by what makes people tick. I have therefore decided to dedicate a proportion of my blog website to interesting people I meet. I also figure it’s much easier to write about other people than it is to write about me (and probably a lot more interesting for all you people out there too). This blog will be a short Q&A session with a very talented artist called Lola Nicol, a West Lothian born artist, who relocated to Glasgow and who now lives in Brora. One of the things I love about Lola is that she combines two of my loves, art and music. 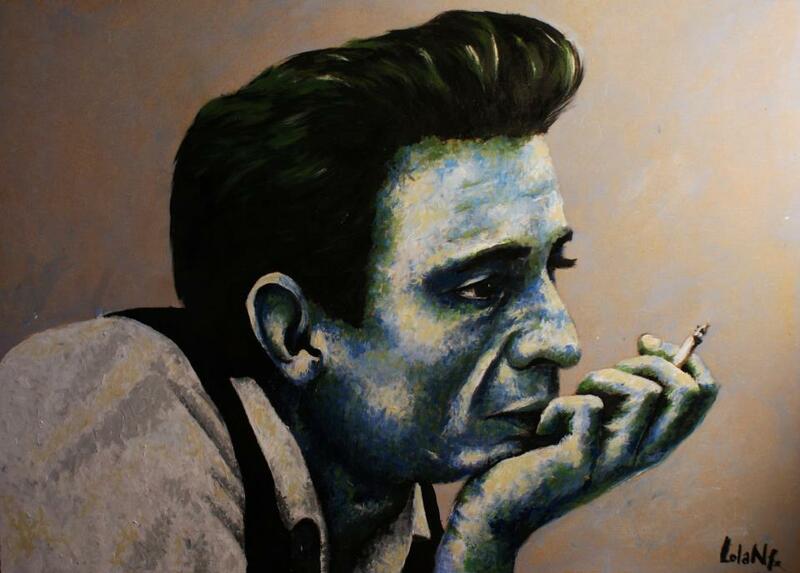 Her paintings feature rock and pop icons as well as some sporting legends. What influences you? Are you influenced by music? I’m influenced by a lot of things. I live in a croft by the beach and I take a lot of inspiration from my surroundings. I miss Glasgow desperately and I feel sometimes I paint to fill that gap. And of course music plays a big part in what I do. I’m a huge fan of live music and I love working alongside some of my favourite bands, whether it be painting for them or having them share my work. I’m proud to be involved and honoured when they take the time to help me promote myself. 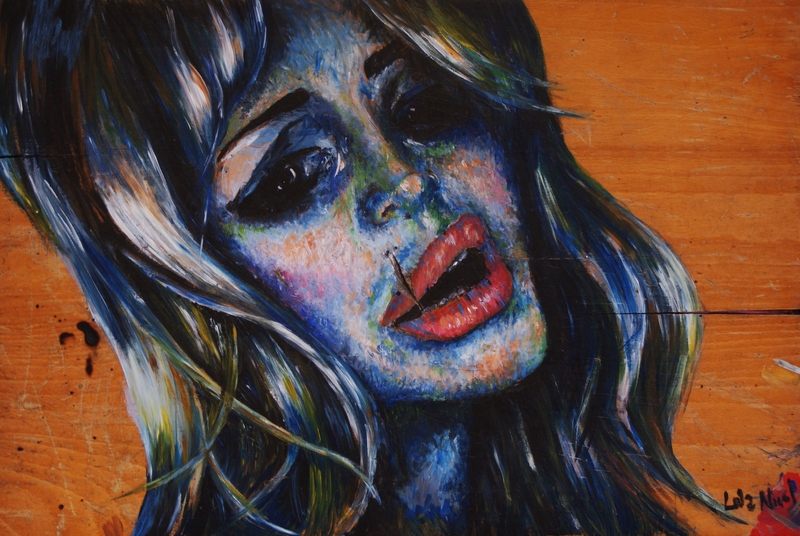 You painted Lana Del Ray before she became well known – why did you choose her? I’m a big fan of her music and she has such a rare beauty. At the time of painting the piece, there wasn’t a lot of press or hype surrounding her. She was very intriguing both in her style and her music. I never thought she would come across the image. It started off as a gift for a friend and it turned out to be much more important than I could have expected. You met Lana at her gig in Oran Mor in Glasgow, what was she like? Lana was very sweet and extremely modest. She asked how the gig sounded and what sort of vibe there was standing in the audience. She also highlighted her fondness for Glasgow and the people she has befriended in the city. And Lana has also seen your artwork. Were you nervous of her reaction? My friend tagged my painting of her on Facebook, so her management became aware of it. I’m surprised when any one compliments my work, so when Lana commented on the piece, it was completely unexpected. I was a little worried because the painting shows a very vulnerable, pained expression, which I guess wouldn’t be the biggest compliment to everyone, but she seemed to like that. The piece is still with me but Lana has the first run of a limited number of prints. Tell us about your collection “Swinging with the old stars”. Who features? I started painting for the collection last summer. It incorporates a number of actors/musicians/models tainted by the industry. The pieces have all been painted on old, damaged or recycled wood which, like these individuals have either been thrown away or damaged (intentionally graffitied or worn with time). It’s a fickle, cut throat existence and I want to portray this in my paintings. There’s often a dark vulnerability to your paintings – where does this come from? All of the emotions I felt in my last few years of living in various parts of Glasgow are painted in the faces of the subjects I work on. I guess it’s my way of expressing myself. Anyone you would most like to paint? I love tainted beauty and anyone beautiful with an air of mystery or misery about them is the perfect subject. Have you always painted? How did you get into art? I painted when I was younger. I studied art at school at higher and advanced higher level but never had the confidence in myself or my art work to take it any further than that. I was very quiet and had huge confidence issues, so I chose not to go to university. I’ve been working in and out of office jobs for a good part of my adult life and only started painting again after I relocated to the highlands. What made you settle in Brora? My family moved there and it gives me time and space to work. It does get lonely at times but my friends and my life in Glasgow are just a train journey away if I need it. Tell us about your studio, what is it like? In the summer I like to work outside when I can. I live beside the beach and have quite a bit of land around me. It’s a really calming environment to work in. Otherwise I have an old wood shed attached to the house, which generally involves wrapping up warm and filling a hot water bottle. My bedroom is also filled with materials and pieces of work. I’ll paint anywhere that’s peaceful with no distraction. What made you use wood canvases? I moved up north with no intention of taking up painting. I didn’t have a job and really just wanted to fill some time. Unfortunately I had left all my canvases in Glasgow and an old pile of school desk tops was the first thing I could get my hands on. Now I can’t imagine working on any other material. I try and use reclaimed pieces when possible – this can range from driftwood to old wardrobes. To be lucky enough to keep painting full time. People’s tastes and ideas change, so maybe I won’t always be this lucky but right now I am completely contented doing what I love for a living.